Sponsored: Happy Monday Everybody! The lovely people at Simply Scrub contacted me and asked if I would be interested in hosting a giveaway (US ONLY) for my readers :) Sure, I said! I love giving away things to my readers! I reviewed some body scrubs from Simply Scrub last year (here) and was really impressed with them. I was also impressed with their philosophy. Simply Scrub products are 100% natural, 100% organic and 100% chemical free! How impressive is that!?! Well now is your chance to try them! 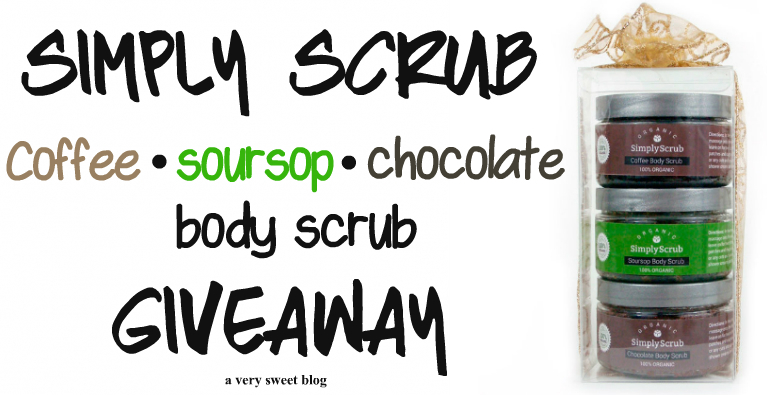 The giveaway prize is worth $36 and Simply Scrub will mail the prize directly to the winner. This giveaway is US ONLY. It starts May 23 and ends June 6, 2016. Use the Rafflecopter widget below to enter. Read the details (terms & conditions). Good luck! Thanks Simply Scrub for this giveaway! Sounds like an awesome giveaway, thanks for sharing! What an awesome giveaway doll scrub is so good for the skin. I adore coffee scrubs and should really buy again, great giveaway and good luck to all contestants! You got me with the fact that these are 100% natural, organic and chemical free! Thanks for another fab giveaway Kim! Great giveaway! I don't use scrubs but I am sure these are wonderful. Nice giveaway, Kim! I've been getting more into using body scrubs. I like this company's philosophy too! I love how they are organic natrual and chemical free!cthe chocolate and coffee one sounds amazing. You at so sweet for doing so many giveaways, Kim! Lovely giveaway! I've been getting more into using body scrubs and I love it! Thank you A Very Sweet Blog and Simply Scrub! I look forward to trying the body scrubs.